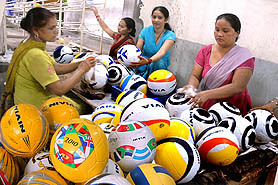 The sports manufacturing houses are meeting the deadlines ahead of the World Cup as the demand is more than the supply. While the soccer mania for the football industry began around October last year but the peak business period has started from March and would continue till May end. In fact football manufacturers feel that the soccer mania in the country may continue post FIFA World Cup.